Sometimes you work and plan and it just doesn't pay off and then sometimes you plan and work and you see great results! 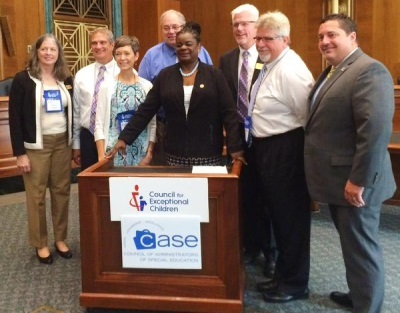 The CEC/CASE Special Education Legislative Summit was a huge success. I don't have the exact number of visits made by the 165+ participants from 42 states, but I can tell you a huge number of congressional offices heard your voice on Tuesday, July 14! If you want to see the MANY tweets that occurred in relation to the event you can see them at #SELS15 or on both the CASE website and the Summit Website. Some of the participants were able to sit in and hear some of the Senate debates on the amendments for the reauthorization of ESEA ... and just two days later the Senate passed their version. What amazing timing to be able to give the House the CEC and CASE ESEA information and encourage them to consider it during the conferencing process and to discuss with the Senators as they were debating their version! Now the key is to follow up! But not just for those who attended but for all of us! Even if you were not in D.C. with us, you still need to schedule time to interact with your legislative delegations during this summer and upcoming school year! As the banner we used for the group shot said: All Educators, All Children, No Limits! Mark your calendar now for next year, July 10-14 — don't miss out on the historic opportunity to make a difference! Speaking of Taking Care of Business... Be sure you register before Aug. 1 to get the early bird discount for the CASE 26th Annual Fall conference: Continuing to Take Care of Business — go to the CASE homepage for both registration and hotel accommodations. Watch for more details as the dates get closer but don't wait too long to get this great price on the Early Bird registration and to get your hotel room at the Atlanta Hyatt Regency! Click here to reserve your hotel room and remember to use the code "case." Want to further your own leadership skills? Don't forget to support your state or provincial unit during the summer months! Many of our units are having state conferences in the month of July. Your leaders work hard to provide you with the information and content you need to lead well! I will be heading to Albuquerque, New Mexico, to present on Leading by Convening: A Blue Print for Authentic Engagement for our NMCASE unit. Your state/provincial units are important but remember CASE gives you the broader perspective and influence! Encourage your colleagues to join CEC and CASE ... and if you aren't a member, why not? For more information on joining, go to the CEC Membership section. 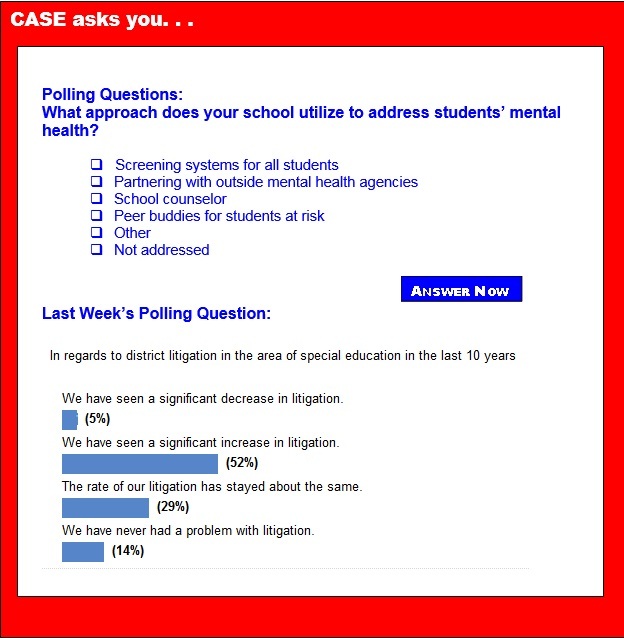 Last Week's Poll asked, "In regards to district litigation in the area of special education in the last 10 years" and of those answering the poll, over half (52 percent) said they had seen a significant increase in litigation! Twenty nine percent said it had stayed the same while 14 percent said litigation had never been a problem. Some of you might want to move there for sure! The lowest response at just 5 percent was a decrease in litigation. It is clear, litigation is still a problem for our local districts! Join us for the next Teaching Students with Autism webinar! This webinar will be recorded and archived in this community for viewing at anytime. As a member of the Teaching Students with Autism community, pre-registration is not required. Log in at www.instantpresenter.com/edweb7 at the scheduled time. This program is sponsored by STAR Autism Support and VizZle. The following awards are open for nominations. Self-nominations are welcome. The deadline for all award nominations is Oct. 15. Information on previous recipients of each award can be found at: http://www.cecdr.org/. My name is Kelly and I am the proud mom of 9.5 year-old twin girls. They are happy, healthy and growing! It wasn't always this way. They were born premature. Their birth weights were 3.02 pounds and 3.15 pounds. Megan did a 3 week neonatal intensive care unit stay and Mackenzie 2.5 months. Upon discharge the nurse said, "We called Early Intervention to come and work with you and the girls." I was in such a haze; I said, "Ok, great." 2015 marks the 40th anniversary of the Individuals with Disabilities Education Act. In the same year, the first center to help parents understand IDEA and how to advocate for their children with disabilities was born. From July 12-15, some 165 special educators attended the 2015 CEC/CASE Special Education Legislative Summit in Alexandria, Va., to study the critical issues facing the field and build advocacy knowledge and skills, all in preparation for their most important mission: To advocate on behalf of the students back home in their districts and states with policy makers on Capitol Hill. Federal officials indicate that less than half of states are meeting their obligations under special education law. The U.S. Department of Education says that just 19 states qualified for the "meets requirements" designation for the 2013-2014 school year. The rest of states were classified as "needs assistance" or "needs intervention." Under the Individuals with Disabilities Education Act, the Education Department must evaluate states annually on their efforts to implement special education programs. The ratings carry significant weight. If a state fails to meet requirements for two or more years, the Department of Education must take enforcement action, which can include a corrective action plan or withholding funds, among other steps. The U.S. House of Representative reconsidered and ultimately passed a Republican-backed reauthorization of the Elementary and Secondary Education Act — though it's far from the measure that President Barack Obama may eventually sign into law when it's all said and done. After considering 14 amendments, including a failed Democratic substitute, members passed the ESEA rewrite, formally known as the Student Success Act, with a very close vote of 218-213. Twenty-seven Republicans crossed party-line to join the entire Democratic caucus in voting against the bill. This year, four more states met the requirements of the U.S. Department of Education's Special Education program. This is the second year of a new, tougher evaluation system, according to Education Week. Nineteen states earned a "meets requirement" rating from the U.S. Department of Education's office of special education programs for the 2013-2014 school year, up from 15 states last year. The new, "results-driven accountability" matrix is reportedly designed to make sure states are committing to special education student performance as well as compliance issues, such as whether states meet various deadlines mandated under the Individuals with Disabilities Education Act. Last year, the federal government spent more than $14 billion to help educate low-income students as part of Title I, Part A, of the Elementary and Secondary Education Act, or ESEA. For schools, particularly low-income schools, these federal investments make a huge difference. If Title I was used to only fund teachers, for instance, it would support the jobs of more than 200,000 educators. But while federal education dollars bring many benefits for students, they are distributed in a way that is deeply unfair both between and within states. This unfairness stems from the following flaws in the allocation formula. Just as a famous chef buys the best quality organic foods to prepare a culinary delight, an expert learning specialist combines the best educational and brain research with creative teaching techniques to accelerate learning. Dr. Jean Piaget advocated using concrete, simple words to insure comprehension. These words should be easily understood through seeing and touching. A baseball might be shown within a player's glove on a baseball field to teach the word baseball or the "B" sound. The month of June marked transitions for many of our students, but few more so than the very youngest. This month, thousands of 3-, 4- and 5-year-olds completed their first years of formal education in San Francisco Unified. Research suggests they will be significantly better prepared to succeed in school because of their high-quality preschool experience. What these children don't know — and it should be invisible to them — is that they are on the leading edge of our district's strategy to align pre-K–3rd grade instruction. Our goal with this approach is to shrink a stubborn achievement gap by aligning primary school teaching to a formerly separate pre-K system. If we are going to bridge the gap, we have to start earlier, and that early work must be connected and coherent with the work in the grades that follow. Children with Attention Deficit Hyperactivity Disorder may be successfully supported in classrooms through strategies that do not involve drugs, new research has indicated. These children are typically restless, act without thinking and struggle to concentrate, which causes particular problems for them and for others in school. A systematic review was led by the University of Exeter Medical School funded by NIHR's Health Research Technology Assessment programme and supported by the NIHR Collaboration for Leadership in Applied Health Research and Care South West Peninsula. The review has concluded that non-drug interventions in schools may be effective in improving outcomes such as performance in standardised tests for children with ADHD. A federal report reinforces the notion that when it comes to state standards, proficiency is still in the eye of the beholder. A top-scoring student on Arizona's reading test may fall far below average in states with more rigorous exams, like Massachusetts or Wisconsin. The new report, by the National Center for Education Statistics, compares each state's performance on state tests with their performance on the 2013 National Assessment of Educational Performance — or NAEP. Asbestos fibers have been found in crayons and other toys sold in the United States, according to a new report from an environmental health advocacy group. The fibers were found in four brands of crayons and two children's crime-scene toy fingerprint kits, according to the EWG (Environmental Working Group) Action Fund report. "We were surprised," said report co-author Sonya Lunder, a senior analyst with the Washington, D.C.-based group. "Crayons and crime-scene toys were found to have asbestos in years gone by, and the manufacturers of both had already promised to deal with the problem," she explained.